Heath entertain Middlesbrough on Saturday in a game that has double the rewards following a ruling by the Yorkshire RFU this week. League points and a place in the Yorkshire Shield final will be up for grabs. Originally Middlesbrough were due to play Bradford Salem in the Shield quarter-finals in November but after postponements Salem withdrew. Heath had already progressed to the semi-finals with victories over Pontefract and Keighley in November. Tomorrow’s fixture is the last in the league for Heath and the runners-up with be looking for a 22nd win in 26 outings, a record which includes wins in all the Calderdale derby fixtures. Harrison was delighted with a 58-12 win at Keighley under floodlights last Friday, when they scored 10 tries to their hosts’ two. Middlesbrough were among the title favourites at the start of the season and beat Heath 34-14 in their opener. Up to Christmas they were in the top four but have only three wins from 11 games in 2019. In the Shield they have had home walkovers against Selby and Salem. Heath will be without Eddie Cartwright (work), Callum Harriett-Brown (University commitments) and Luke Saltonstall (hamstring) but Ezra Hinchliffe returns at centre, the evergreen Si Brown on the wing and Chris Robinson (wing) and Jack Crabtree (full back) step up from the bench. Fergus Marsden is back from injury on the bench alongside Jordan Moana and Chris Piper. Harrison said Heath would be going all out for a double - promotion via the play-offs and winning the Yorkshire Shield to round off a superb season. Rishworthians go into a home game with champions Moortown, knowing that even if they pull off a shock result, their Yorkshire One future will rest with other results. Moortown have been the outstanding team in the division and have only lost two league games in the early weeks of the season at fifth placed Beverley and second placed Heath. Rishworthians are three points behind Hullensians, who have a home game against Selby and must be favourites to stay up. 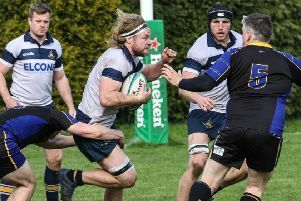 The Copley men put in a great performance last week to win at Brods and complete a double over their neighbours, but while they have been achieving heroics in the battle to avoid the drop, so too have the teams around them. They will have significant absentees against a Moortown team they have never beaten in Anthony Shoesmith, Ed Cockroft and Ben Sutcliffe. Ollie Akroyd will be demanding a response from his players they travel to Beverley on Saturday for their final league game of the season (3.0). The Woodhead boys will have to lift themselves following the disappointment of last Saturday’s narrow home derby defeat to Old Rishworthians. Brods have now lost three in a row and are in danger of missing their top-six target. They now lead Dinnington only on points difference. “The result is a really poor one for us and it will take some time to work out how we lost,” he said. Brods’ record at Beverley is modest and it will take a big effort to repeat their victory over the East Yorkshire side in the season’s opener, when they came out on top 40-26. Old Crossleyans complete their league programme at Dinnington and victory will ensure a top four place. Club spokesman Howard Cooper said he would have settled for that beforehand in his side’s first season back in this division. The Crocs brushed aside visitors Bradford Salem 47-7 last week but can expect a much tougher test against foes who are difficult to beat at home. 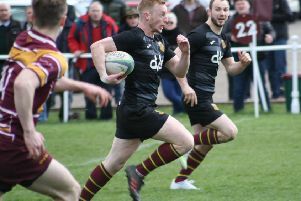 “Dinnington tend not to let the ball go beyond their stand off and are very much forward-dominated with a large pack who like to scrummage and catch and drive from the line outs. Halifax Vandals took a giant step towards safety in Yorkshire Three last weekend with a 32-17 home win over Hemsworth. They travel to Aireborough on Saturday and it promises to be a tricky trip to the Leeds club, one of two sides who can still overhaul the fourth-from-bottom Warley men. Halifax had a home walker in the Yorkshire Four Shield against a Sheffield Oaks side unable to raise a team for the fourth time this season. The Ovenden Park side travel to play Burley in the semi-finals tomorrow while Stocksbridge host Thirsk in the other game.